Great Italian food can be hard to come by these days. Providing quality Italian cuisine that embodies the true spirit of Italy is what we strive for here at Jonathan’s Ristorante. We offer a luxury dining experience that people of any culture or background can come and enjoy. We welcome those who have a great appreciation for quality food, and we wish to offer the best service in return. If you are looking for Italian Restaurants in Huntington, NY, Jonathan’s Ristorante is here to serve you with a fantastic overall dining experience. At Jonathan’s Ristorante, we have a diverse menu with numerous options to accommodate different palette’s and preferences. Our traditional Italian menu offers various complexities that suit all kinds of tastes. Arugula, which is served with cherry tomatoes and citrus vinaigrette. Insalata Autunno, which is bibb lettuce, pistachio, celery, apple, fennel, and grapes, served with apple-infused vinaigrette. Mista Robiola, which is served with beets, pomegranate, robiola cheese, and walnuts. Arancini, which is mushroom mini rice balls with truffle aioli. Parmigiana di Melanzane, which is eggplant parmesan. Piadina, which is flatbread with ricotta, mushrooms, asparagus, shallots and truffle oil. Agnolotti di Zucca, which is pumpkin ravioli, sage sauce, amaretti cookie dust, and parmigiano shavings. Bucatini, which is served with nonna alba’s bolognese sauce. Linguini Vongole e Pancetta, which is served with pancetta, clams, roasted garlic, and habanero chile. Pollo al Limone, free-range chicken on the bone served with roasted potatoes, lemon/rosemary sauce, and french string beans. Salmone served with butternut squash, apple, haricot vert, caramelized walnuts, trumpet royal mushrooms, and balsamic reduction. Anatra Arance Rosse, which is long island duck breast, blood orange sauce, brussel sprouts, and baby carrots. If you are looking for great Italian restaurants in Huntington, NY, come down to Jonathan’s Ristorante! We offer quality food and atmosphere for our customers and ensure that each person leaves our restaurant with a smile on their face. It is our goal to provide the best Italian cuisine and even better service to retain our base of customers. If you have a love for great Italian food and are searching for one of the best Italian restaurants in Huntington, NY, then Jonathan’s Ristorante is the place for you! Contact us if you would like to make a reservation or if you are interested in our catering options. See you soon! 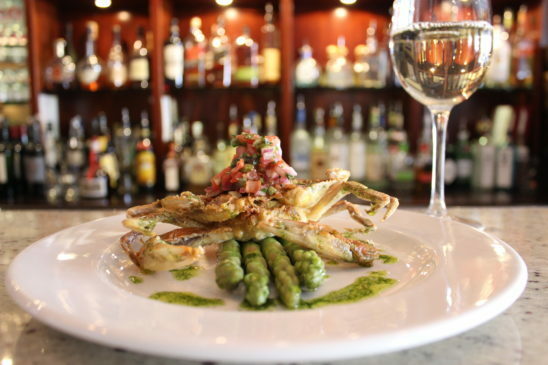 If you have a love for great Italian food and are searching for one of the best Italian restaurants in Huntington, NY, then Jonathan’s Ristorante is the place for you!